How much biosolids are produced in the RDN each year? Why are biosolids such a good fertilizer and soil amendment? What are the goals of the Forest Fertilization Program? Where are RDN biosolids being applied? How are biosolids stored and applied? What do the fertilized sites look like? How do biosolids improve tree health? Where else has this type of project been done? Are there any public health risks from biosolids? Will there be effects on my well water? Will access to the forest be restricted during or after biosolids applications? What controls are in place to protect public health and the environment? Biosolids are the solids that result from municipal wastewater treatment and meet strict requirements outlined in the Organic Matter Recycling Regulation. Because of their stabilized, nutrient-rich, and humus-like properties, biosolids provide a sustainable alternative to chemical fertilizers as a means to increase soil fertility where nutrients are limited and improve soil quality through the addition of organic matter. Roughly 4,300 wet tonnes of biosolids are produced in the RDN every year. During the treatment process, sludge (organic and inorganic materials that settle in a primary clarifier or secondary clarifier) is sent to digesters for solids processing. During this process, micro-organisms use the organic material present in the solids as a food source and convert it to by-products such as methane gas and water. Digestion results in a 90% reduction of pathogens and the production of biosolids, a wet material that contains 95-97% water. Mechanical equipment is used to remove water from the biosolids, producing the final dewatered soil-like product. Biosolids are composed mostly of water, nutrients and organic matter. Organic matter helps soil to retain water and nutrients so they are available for plant growth. Biosolids also contains nitrogen, phosphorus, and other macro and micronutrients that plants need for growth, as well as trace elements and microorganisms. Contain nitrogen, phosphorus, potassium, other macronutrients, and many micronutrients essential for healthy tree growth. Release nutrients over several years, providing a sustained source of nourishment. Contain organic matter, which helps soil to retain water and nutrients and generally improves soil quality. To promote and participate in the sustainable environmental management of our Region's resources. 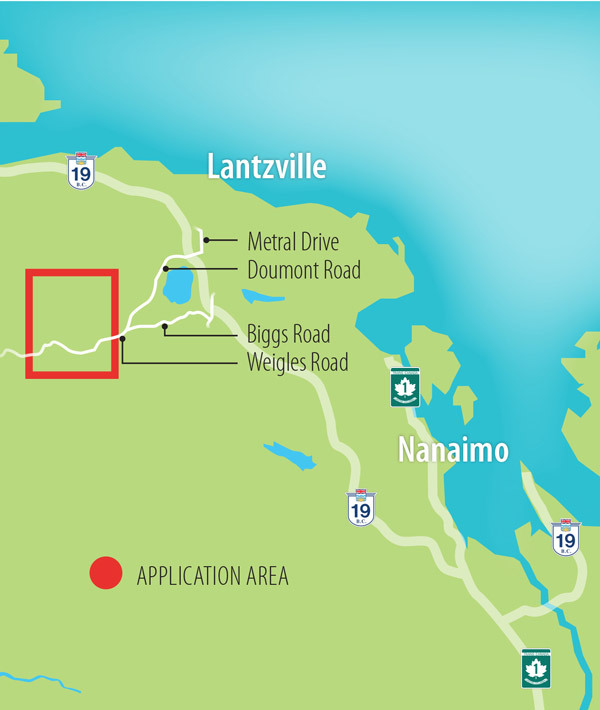 Biosolids are applied to approximately 600 ha of land located 12 km northwest of Nanaimo and about 1.1 km west of the Biggs/Doumont Road intersection (just off Weigles Road). 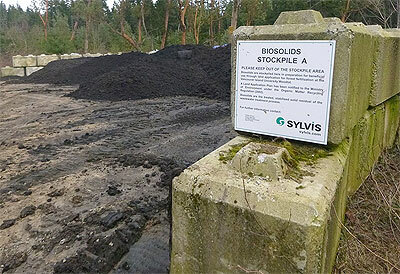 Biosolids are trucked to storage sites located within the fertilization area. Once a sufficient quantity is stored, the biosolids are loaded into a specialized biosolids application vehicle. The vehicle has a large box which feeds the biosolids into a high-speed side throw fan. The biosolids are carefully applied to pre-selected application areas at a rate which supplies the minimum sufficient amount of nutrients to soil organisms, understory vegetation, and trees. Biosolids storage facilities at the woodlot are paved, walled on three sides, and covered during the rainy season. The biosolids stockpile locations at the woodlot are paved and signs identify them and provide contact information for follow-up. Fertilized sites appear to be covered by a rich, dark topsoil material at an average depth of 1 cm. The biosolids Forest Fertilization Project has demonstrated increases in tree growth of 80% over 18 years. Tree stands in the Biosolids Application Area grow on nutrient-poor rocky soils which are classed as "very dry" sites due to the naturally low organic matter and summer drought conditions. Biosolids helps trees to achieve their maximum natural potential as though they were growing in ideal conditions. Trees treated with biosolids also appear healthier; needles and buds are longer, greener, and more numerous. Biosolids have been widely used in Canada, the United States, Europe, and across the world for over 70 years. In BC, the most common uses are as a feedstock in composting or soil fabrication, followed by beneficial use in agriculture, mine reclamation, and forestry. Metro Vancouver has completed forest fertilization projects throughout the province following early work in collaboration with the University of British Columbia demonstrating the potential for using biosolids as a forest fertilizer. Seattle, Washington has over 30 years of experience fertilizing forests with biosolids. Biosolids are treated to standards that align with the US Environmental Protection Agency's standards for biosolids, which were developed with the aim of protecting human and environmental health. Biosolids treatment through aerobic or anaerobic digestion kills most of the microorganisms in biosolids; the rest die off naturally once they are exposed to sunlight and cooler temperatures in the soil. However, since biosolids are not pasteurized, there is a small risk associated with getting biosolids in one's eyes or mouth, just as there would be for other animal manures. Trace elements in biosolids are carefully monitored to ensure the biosolids remain compliant with the Ministry of Environment and Climate Change Strategy's Organic Matter Recycling Regulation. Trace elements enter the wastewater collection system from residences, businesses, and storm water runoff. Many of these trace elements are micronutrients and actually benefit plant growth, but they can be harmful in excess concentrations. Some trace elements are typically found at lower concentrations in biosolids than in the soils they are applied to. In BC as in many other jurisdictions, trace elements are monitored in biosolids; however, unlike many other jurisdictions, in BC they are also monitored in the soil. Assessments carried out in 2003 and 2012 concluded that past and proposed future applications of biosolids within the Application Area will not impact groundwater quality in any of the wells located in the region. Ongoing surface water monitoring reveals that water quality at the biosolids fertilization site remains within a range which is typical of background water quality. Research performed by Vancouver Island University has shown that trace elements introduced into the soil as a result of biosolids fertilization generally do not move far below the soil surface, usually within 5 to 10 centimetres, similar to results from many other studies. Nevertheless, to assure the safety of water supplies, biosolids applications occur only on suitable slopes and at least 30 metres from any watercourse. 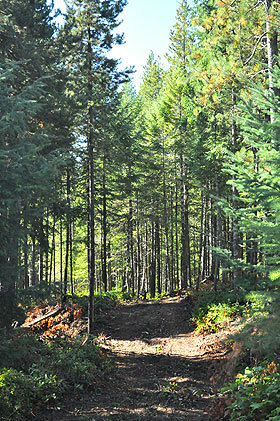 The RDN's biosolids forest fertilization project is located on private land and as such access is restricted. The RDN has an agreement with the Nanaimo Mountain Bike Club to coordinate land use and as such Club members and other mountain bikers are granted access to specified biking areas at the property. Outside those areas which are dedicated to mountain biking, notification signs are posted when biosolids applications overlap with recreation areas. Biosolids land applications are carried out according to a Land Application Plan which must meet all requirements set out in the Organic Matter Recycling Regulation and is subject to audit by Ministry of Environment and Climate Change Strategy staff. The Land Application Plan contains details including soil quality, biosolids quality, biosolids management details, and site-specific management methods. Additional information is also gathered on nearby water features, well locations, and nearby residences. The Land Application Plan is notified to the Ministry as well as Island Health. Regularly monitor surface water at the site.